Best Ever Bucket List Stuff: Painting the Street! I am a big believer that people should have a bucket list. Whether it’s written down on paper, stored in your computer, or hanging out in the back of your mind, I am of the opinion that everyone needs something to strive for and that having adventures and meeting goals makes life more interesting. I’m also a big believer that people of *all* ages should actively work on their bucket list – both completing things on their current list and coming up with new things to add. I used to think working on the bucket list was something you did when you were older – like Morgan Freeman and Jack Nicholson did in the movie, but as I get older and watch friends and family members leave this earth way too soon, I have accelerated my efforts to go places and do things on my own list. Last weekend, I did just that. As I wrote in my post about Snake Invasion, I love St. Pat’s. Specifically, I love the St. Pat’s celebration at Missouri University of Science & Technology. During my years at MS&T, I did just about every St. Pat’s activity you can think of short of joining the St. Pat’s Board – I was a Student Knight, I was a candidate for Queen of Love and Beauty twice, and I participated in a zillion and four games and activities each year. I was a big enough fan of St. Pat’s that I used my influence as a student government leader to advocate for the St. Pat’s Board to campus administration during a time when they were struggling. And I was friends with countless Board Reps, and dated one for three years during and immediately after school. 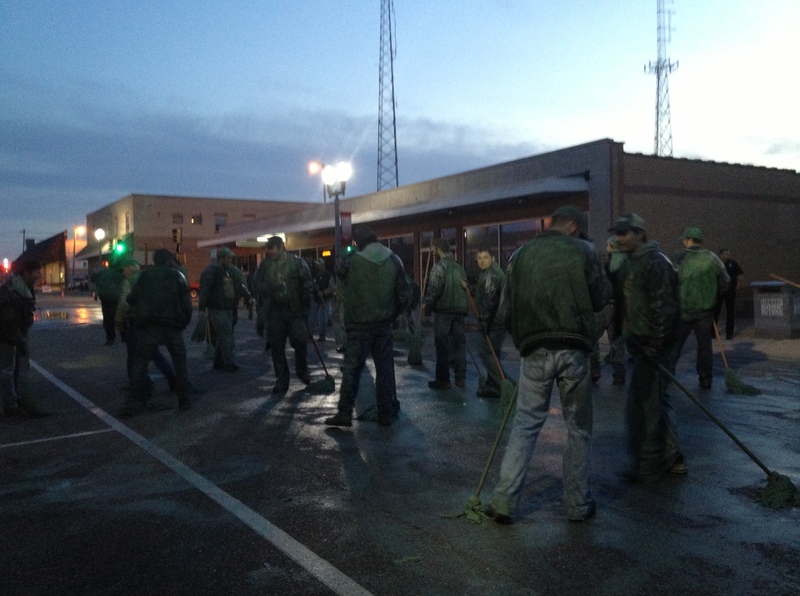 One of the time-honored traditions of St. Pat’s is Street Painting. 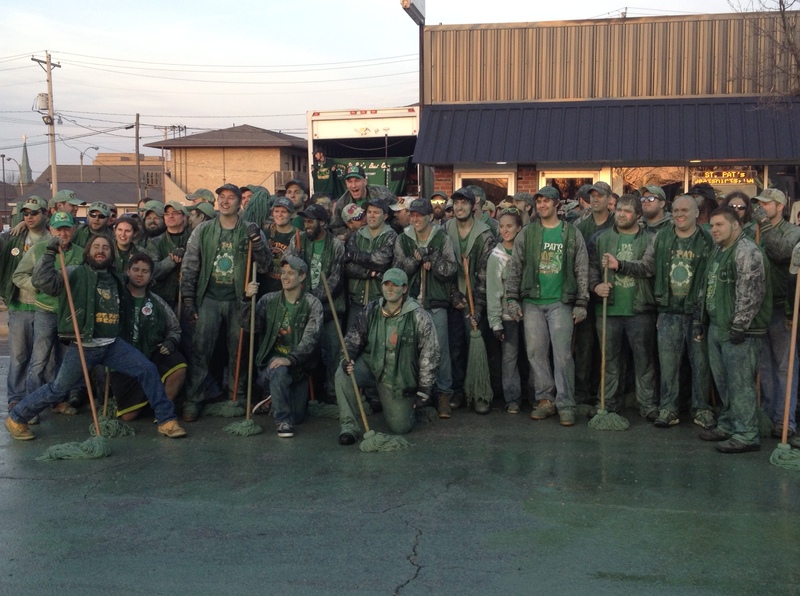 On the Saturday morning of St. Pat’s weekend, former St. Pat’s Board members (called Alumni Reps) are invited to meet in downtown Rolla to paint the parade route green. This is one of the events that people who spend their college careers on the St. Pat’s board look forward to, because it means They Have Arrived – they aren’t responsible for planning a celebration for the town and the campus to enjoy anymore, they finally get to enjoy it. This is one of the few St. Pat’s events that isn’t open to all campus organizations and students to participate in – only Alumni Reps and former Queens of Love and Beauty are invited to participate, though anyone is welcome to come and watch the proceedings from the sidewalk. Since I am neither an Alumni Rep nor a former St. Pat’s Queen, but instead more of a St. Pat’s Board groupie, I never expected to paint the street as much as I would have liked to. Street Painting was therefore a Bucket List item that I expected never to achieve. This year, after about a 10 year hiatus from St. Pat’s in Rolla, I finally went back. 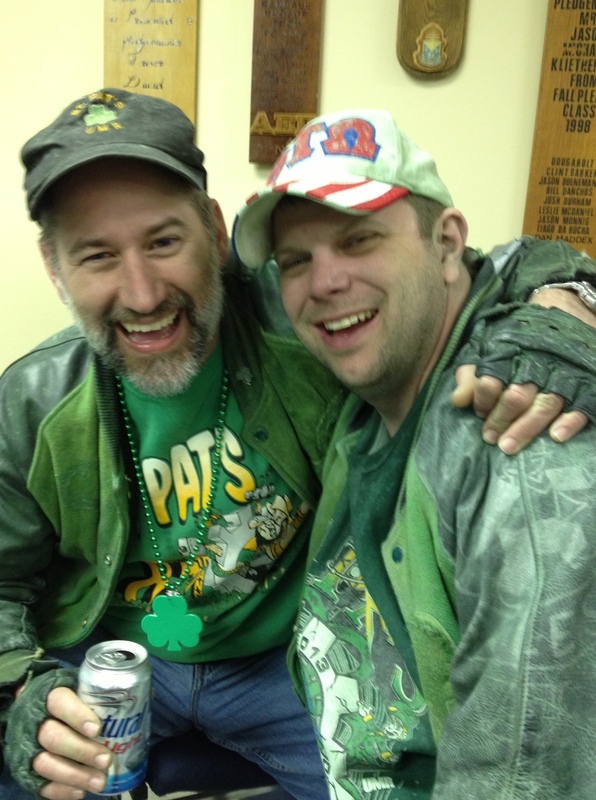 I had business in Rolla for my sorority chapter on Saturday afternoon, so I declared St. Pat’s 2013 to be Bring My Own Board Rep year, and made plans to make the weekend of it with my dear friend Jeff, an alumni rep from 1995. 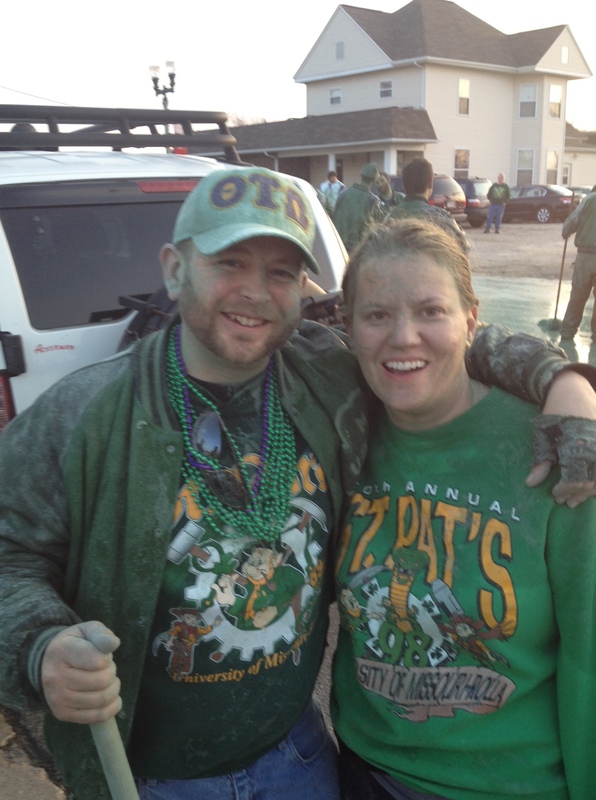 Though Jeff lives in Denver, he has gone back to Rolla for St. Pat’s almost every year since he graduated. I was a little nervous about going back after so many years, but decided to just jump right in. We arrived in Rolla on Friday, spending the afternoon a Gonzo Games on campus and then at Jeff’s fraternity house. I had dinner with several of my Kappa Delta friends who also came to town, and then headed to the Grotto (aka, best college bar in the universe). Friday night at the Grotto – which happens to be owned by yet another Alumni Rep who came to Rolla, found the love of his life, and has stayed ever since – is a little like homecoming or a high school reunion, only more fun because everyone is very casual and nobody tries to give out lame awards for the person who traveled the farthest to be there. Time seemed to stop in the Grotto while I visited with old friends I hadn’t seen in years, made a few new friends, and actually reconciled with someone I had a falling out with in college. Eventually, we were chased out of the bar because it was closing time, and Jeff and I went back to our hotel. I am not Jeff’s Mom by a long shot, but as the one with the car, I felt responsible for getting him where he needed to be. But I saw an opportunity, so I told him. Jeff’s a smart man, so he said OK. And off we went. We parked downtown and walked over to the starting area to get our equipment. There are no fancy-pants painting implements involved in street painting – you are issued an old school mop like your grandmother would have used, and the street paint (which is basically whitewash dyed green) is in big plastic barrels every block or so along the parade route. Jeff and I got our mops and then joined the crowd of people – and I do mean crowd – who were already busy. It did not take me more than about two minutes to realize that the fun part of Street Painting has less to do with painting the street and more to do with painting your buddies. For the most part, people let me off easy because they either a) decided it isn’t nice to hit girls with a mop too often or b) weren’t sure who I was and what price they would pay for messing with me. My friend Dustin was the exception – he made sure I got good and green. Jeff and a few other guys I knew Back In The Olden Days When Dinosaurs Roamed The Earth And I Was In College helped him out. You can’t really tell it from the picture, but by the end of this adventure my hair was completely green – to the point I was wondering if my blonde highlights would go back to being the proper color – and my skin was too. When I cleaned up later, I was amazed at how much green stuff was in my ears of all places – thank goodness I packed Q-tips so I could get myself properly cleaned up before my more dignified afternoon activities! When you put mops in the hands of several dozen Alumni Reps, a certain amount of hilarity and a bit of mayhem is bound to follow. Some of he highlights from my morning…. *The active Board Reps responsible for mixing the street paint didn’t put enough in all the buckets, so there were a lot of people trying to go find more paint, or poaching paint from buckets farther down the parade route. I think the funniest remark was from one Alumni Rep who kept blaming the street paint shortage on Congress. “Stupid Congress didn’t do anything to stop the sequester and now we’re short on street paint! WTF gives?” At one point, someone urged me to write my Senator about the issue. *A few alumni reps from the Interfraternity Council -who wear gray jackets and have a bit of a rivalry with the St. Pat’s board due to their role in planning Greek Week – showed up to paint the street, which is not really legit according to Hoyle. The guys in question were close friends with St. Pat’s reps, so nobody tried to kick them out. However, at least one IFC guy figured out he crossed a line somewhere along the way when he found himself getting wrestled to the ground by a St. Pat’s alumni rep. If you’re wearing the wrong color jacket at Street Painting, don’t expect sympathy if you get knocked around just a little bit. *Several people from one of the Christian ministries on campus brought free coffee and doughnuts for the street painters. This is both an amazing thing, and also would surprise a lot of people because most St. Pat’s Board members have a reputation enjoying a drink or two or five, which is not normally behavior you see most religious organizations support. But there they were, feeding the masses with java and carbs as if they were loaves and fishes – and probably sobering a few people up enough to watch the parade. As the group wrapped up greening the street, we waited for the Grotto to open for breakfast and the official St. Pat’s photographer took a picture of the smiling, green swarm of humanity. My heart did a little flip-flop as I heard the group say “THANNNK YOUUUUUU” in unison after each picture was snapped, which is part of the traditional St. Pat’s photography ritual and just another little nugget I remember about why St. Pat’s is so much fun. All in all, painting the street was the highlight of my weekend, and I’m glad to mark another item off the bucket list. The rest of the day, after I used virtually all my shampoo getting the green out of my hair, I was mostly a responsible grownup, attending an alumnae luncheon at my sorority house and a fundraiser later in the afternoon. After all the official duties were over, I took a nap, had a cheeseburger, and went back over to Jeff’s fraternity house where I saw quite a few street painters – none of which were quite ready to wash off the green. And thus, the fun of street painting continued for the rest of the evening – which is, I’m told, exactly how it should be. Here’s to the 105th Annual Best Ever St. Pat’s, and looking forward to the 106th!